Doom of the Dinosaurs Exhibit at Cranbrook Institute of Science review, pics, hours, and info. Cranbrook Institute of Science Doom of the Dinosaurs: Are We Next? is a family friendly exhibit that runs through September 1, 2019. The Cranbrook Institute of Science Dinosaurs Exhibit tells the story of the Earth’s past mass extinctions and explores the prehistoric times when dinosaurs ruled the land. Children will enjoy activities created just for them. 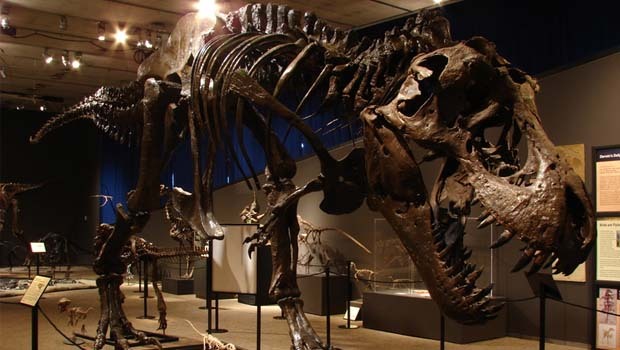 Visitors will see full-size dinosaur skeletons, including Tyrannosaurus Rex and Edmontosaurus, and walk through the five large-scale mass extinctions that occurred over the last 500 million years. The exhibit is interactive so visitors can read up on facts and evidence throughout the exhibit to decide for themselves if we’re headed for a sixth mass extinction. Dinosaurs featured in the latest Jurassic World movie, Jurassic World: Fallen Kingdom, like the Edmontosaurus and Stan the Tyrannosaurus Rex, are on display in the exhibit. Guests will also learn about what led to the demise of trilobites, sea scorpions, proto-mammals, ancient coral reef dwellers, ancient sea life, armor plated fish, mastodons, and other extinct animals that once roamed Michigan. Additionally, visitors can get a hands-on, paleontology experience in exploreLAB: Dinosaurs and Fossils. They’ll discover dinosaurs and fossils like a paleontologist and learn what it takes to unearth and preserve these treasures. Combo tickets for the exhibit and exploreLAB can be purchased at a discounted rate – availability is limited. $6-$8 PLUS Regular Admission ($13 for adults and $9.50 for children 2-12 and senior citizens (65+); children under 2 and members are admitted FREE). Admission is free after 5p on the first Friday of each month. Other Fridays and all Saturdays after 5p admission is reduced to $6.50 for adults and $5.50 for children 2-12 and senior citizens; children under 2 and members are admitted FREE. For information about becoming a member of Cranbrook Institute of Science, call 248-645-3200 or visit science.cranbrook.edu.